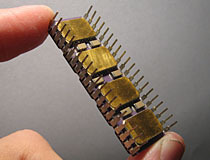 The 7M912, manufactured by Integrated Device Technology, is a 64k 9 bit CMOS static ram module constructed out of leadless SRAM chips bonded to a multi-layer ceramic substrate. 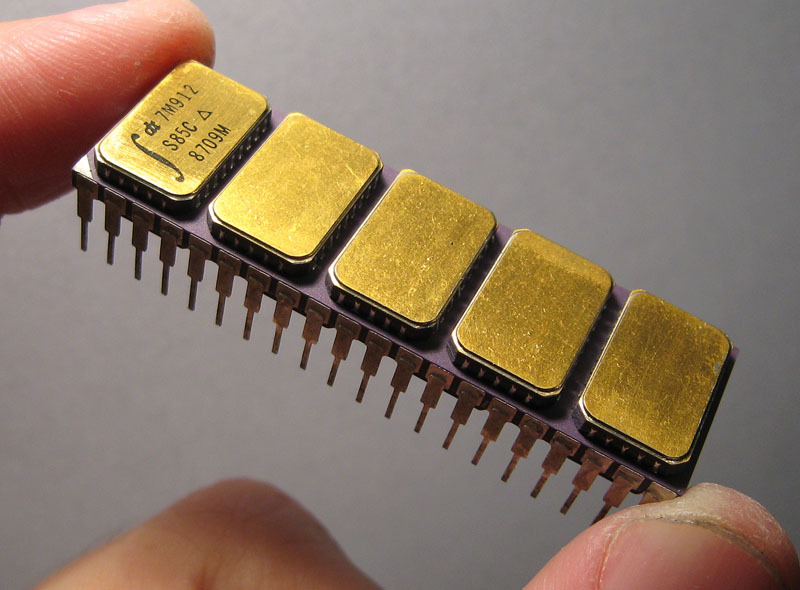 THe 7M912 is built from nine separate IDT7197 SRAM integrated circuits, five of which are attached to the top surface of a ceramic carrier with the remainder being mounted to the underside. This integrated circuit is military rated, and is designed for use in harsh environments and high demand applications. The 40 pin package has been manufactured with extra-long leads, to prevent socket insertion from fouling the chips on the underside of the package. IDT also made an 8 bit version of this chip, the 7M812. The 7M812 is identical in function to the 7M912, but only utilizes 8 IDT7197 SRAM ICs. 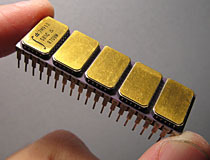 IDT 7M912 static ram integrated circuit. The 7M912 is thoroughly encrusted with jewels smaller leadless SRAM ICs.